Liverpool’s innovative and highly influential ‘second wave’ music scene is to be chronicled in a new box set. Set for release on 9 February through Cherry Red, Revolutionary Spirit: The Sound Of Liverpool 1976-88 follows the city’s music scene out form under the legacy of The Beatles and the Merseybeat era, through the door opened by the arrival of punk and into the art school refectory. 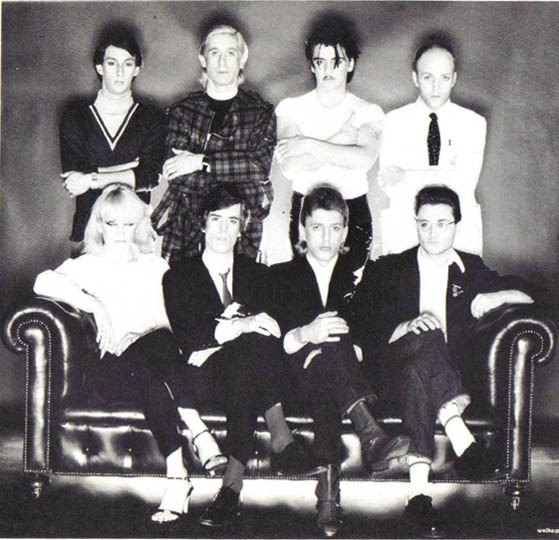 Kicking off with the legendary DEAF SCHOOL (pictured), BIG IN JAPAN and THE YACHTS, this 5-CD 99-track set alights on the post-punk boom led by ECHO & THE BUNNYMEN, THE TEARDROP EXPLODES and ORCHESTRAL MANOUVRES and into the 80s with A FLOCK OF SEAGULLS, THE ICICLE WORKS, PALE FOUNTAINS, IT’S IMMATERIAL, WILD SWANS, THE LA’S, FRANKIE GOES TO HOLLYWOOD, THE WALKING SEEDS and loads more lesser known but equally worthy acts. The set is completed by a 56-page book, featuring artists’ sleevenotes, essays from scene observers and participants Bernie Connor, Mike Badger, Yorkie and Joe McKechnie, and illustrated with many rarely seen photos. Full track-listing and pre-order is available here. Recently reformed, Deaf School have just released Let’s Do This Again Next Week, their first full-length album of all-new material since 1978. It’s available here. ‹ MOD REVIVAL UNDER THE SPOTLIGHT!